These reusable water balloons will be a hit with your kids and your neighbor's kids. No need to keep buying and filling latex balloons. 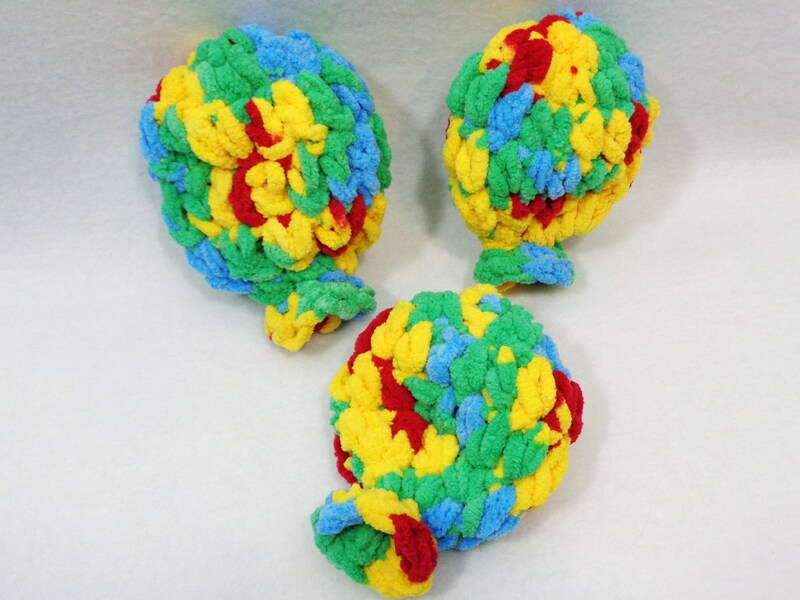 Just put these great crocheted balloons in a bucket or tub of water and they're ready to go. Play some catch, throw them nicely at your family and friends, or use them for target practice. Find other fun games to play with them. Then just rinse them out, lay them flat to dry and they'll be ready for the next time! Please allow 2 to 3 days for me to make your balloons at time of purchase. You can buy one or more. If you'd like a large quantity for birthday party favors, please contact me for a special listing. They are made from 100% polyester yarn. They come with a mixture of green, blue, red and yellow yarn! They are approximately 4 1/2 inches tall and 3 1/2 inches across. They are machine washable if needed or can be washed by hand. Order 6 or 8 and I'll include a free mesh bag! Please check out my shop for other great crochet items! I'm always looking for water activities to do with our son during the hot summer months in Texas. This is unique idea, are fun to use & dry fast! EXCELLENT! The kids loved the pencil toppers. And the order shipped in very quick turnaround time from the time I placed the order. At the current time, I take Etsy Direct Checkout and Paypal. If payment has not been made within three days of purchase, the item will be relisted in my shop to be resold unless other arrangements have been made. Need help checking out. Look here. I want you to be happy with your purchase. If for some reason you aren't, please contact me. A refund will be made upon return of the item in the same condition it was sent, minus shipping charges. We can also discuss an exchange if you prefer that. I usually ship items first class without insurance or tracking, unless the size of the item requires priority shipping charges. This saves you money on shipping. If you prefer priority shipping there is an option for you at checkout for priority shipping. It includes $100 of insurance. International orders will be listed as the cost paid for the item and custom charges are the purchasers responsibility. Also, now available, if you live locally, I'd be happy to drop your purchase off at a little shop in Belleville, IL called Local Lucy's. Just use the coupon code LUCYS at time of check out and you won't be charged for shipping and I'll let you know what day I'll be dropping your package off at the store.